Our decorative tissue pom pom decorations are the perfect addition to any party. Sold as a pack of 3, this set comes in 2 different shades of Blue and a White. Each individual one measures 40cm (16''). 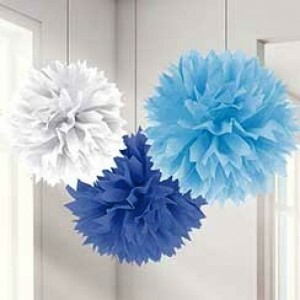 Our decorative tissue pom pom decorations are the perfect addition to any party. Sold as a pack of 3, this set comes in 2 different shades of Blue and a White. Each individual one measures 40cm (16''). Please note: The Pom Pom's come flat packed and need to be assembled.